As we pointed out in our first drive of the all-new TLX, Acura has gone a long way towards revitalizing its sedan lineup with this replacement for the TL and TSX, so I was looking forward to having one to try out for a full week. The TLX model I had for the week came with a 2.4-liter, 206-horsepower i-VTEC inline-4 with 8-speed Dual Clutch Transmission with torque converter and Precision All-Wheel Steer (P-AWS). The TLX is also available with 3.5-liter, 290-horsepower i-VTEC V-6 with 9-speed automatic transmission and P-AWS, and with this version, you can get all-wheel drive as well. You’ll immediately notice Acura’s signature Jewel Eye LED headlights on the TLX. This new look has upgraded the styling across the Acura lineup and looks fantastic on the TLX. The overall design is sporty but classy, and compared to the 2014 TL the 2015 TLX is 3.7-inches shorter in overall length while maintaining the same wheelbase. As you can see from the photos, the TLX design looks great from every angle, and I loved the look of our Crystal Black test model. The interior is stylish and comfortable giving consumers exactly what they would expect for a luxury sport sedan. Our model featured the TECH package with a navigation system that featured voice recognition controls and a multi-view rear camera. Other notable upgrades included perforated leather trim seats, a premium audio system with ten speakers that produced excellent sound, blind spot information, forward collision warning, lane keeping assist system and a rear cross traffic monitor. Also, if you’re an iPhone user like me, all TLX models come equipped with Siri Eyes Free technology that lets the driver access the features of Siri using familiar voice commands. I wasn’t surprised that the TLX was fun to drive and I hated letting it go after a week. We had some bad weather, but the TLX performed well in all conditions. The 2.4-liter engine produced solid power and responsiveness but I’m sure I would go with the 3.5 liter V-6 if given the choice. I would recommend test driving both to see which suits you better and definitely try the Sport and Sport+ modes to see how you can push this vehicle. The handling was also excellent and the ride was firm yet very comfortable. This is the kind of vehicle that practically everyone will enjoy, which is what you expect from this segment. The entry-level luxury sport sedan segment is very competitive and consumers will find many great options to choose from as all the automakers are upping their game. 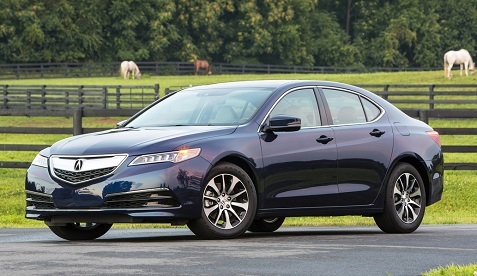 With the new TLX, Acura has a worthy competitor for this market. The vehicle we tested comes with a price of $35,920 including delivery fees, which offers a great value for this luxury model. We definitely recommend checking this one out.